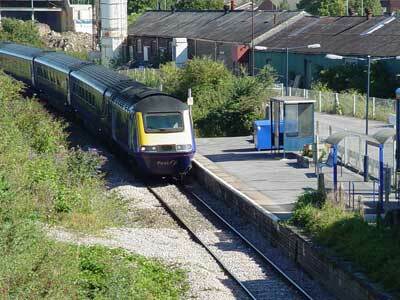 The 08:52 express from Paddingto to Penzance runs through Melksham station on Sunday, 21st August 2005. Although this train ins a "125", it's had to slow right down for the severe speed restriction on the curves at Melksham. 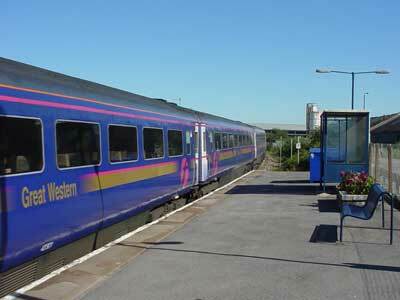 Past experience has taught us that First won't stop their train at Melksham, though ... even at times where they've taken over the line to the exclusion of the local service as they did for several weeks in 2004. Let's hope they're more understanding of their Melksham customers if they win the franchise. 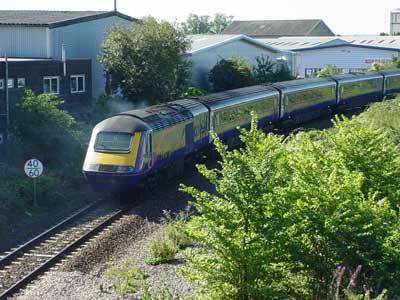 21st August was a busy morning on the line through Melksham. 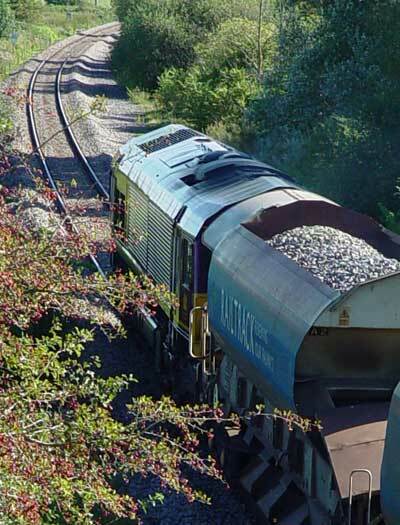 Within an hour, the two West Country expresses pictured above and below passed through ... as did this stone train. The 08:30 Exeter to Paddington First Great Western train passes through Melksham on 21st August ... the direct route through Pewsey and Newbury was closed for engineering works, so the Melksham line used for diversions. I for one very much welcome these extra trains; it means that the cost of mainenance and running of the line shouldn't all be placed at the door of the local services - heck, the line's needed as we saw that morning. And I note that there's probably not going to be a "normal" weekend with just the regular scheduled trains on the line until November!